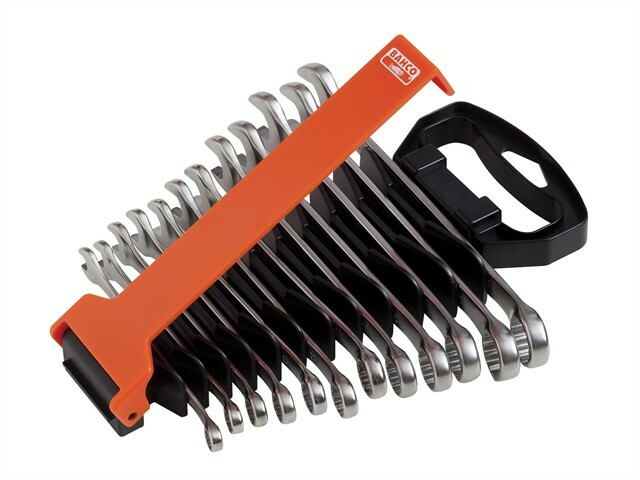 The Bahco 111M/SH12 is a set of 12 Combination Wrenches in metric sizes made from a high-performance alloy steel in a patented U shape design. Their U shape shank provides better comfort with the open end angle being 15º with a slimmer head for better accessibility. The 12-point Dynamic-Drive Profile provides longer life for screws and nuts and the ring end angle is 15º for knuckle clearance or better grip. They have bigger and bi-directional size marking for easy identification and have a chrome plated Micro Matt finishing which provides a high-quality surface. Standards: ISO 691, ISO 7738, ISO 3318, ISO 1711-1 and DIN 3113.